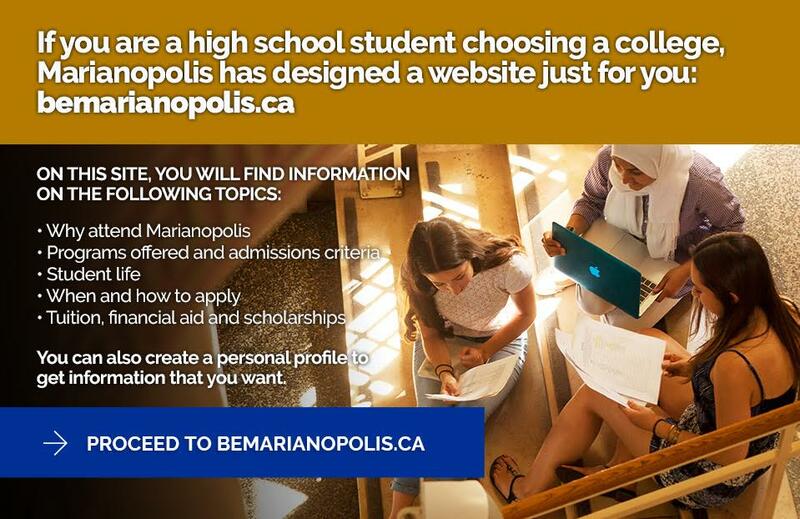 At Marianopolis every person and every resource is dedicated to student success in the classroom and beyond. Here are the campus services and resources that provide personalized support to students each day. Academic Advisors, in collaboration with faculty, offer workshops throughout the year to help students with various elements of applying to university: writing a letter of intent, preparing a cv, practicing for admissions test and interviews, etc. Certain workshops focus on entry into French universities, while others provide details on specific university programs such as pre-Medicine and pre-Dental. Academic Advisors are available every weekday. Students may book a 30-minute appointment through Omnivox. An advisor is also available to see students without an appointment during drop-in hours from 11 a.m. to 2 p.m. Monday to Thursday and from 11 a.m. to 12:30 p.m. Friday. The Marianopolis College Institutional Policy on the Evaluation of Student Achievement. The AccessAbility Centre offers support services to students with diagnosed disabilities such as learning or physical disabilities, ADHD, visual and auditory impairments and mental health, as well as temporary disabilities such as a broken hand. As part of the Marianopolis Plan for Success, the AccessAbility Centre and the Adapted Services Counselor offer services such as student advocacy and workshops, one-on-one coaching on learning and organizational strategies, faculty support, information for parents and help in transitioning from high school and/or to university. Students who provide appropriate documentation may register with the AccessAbility Centre and benefit from an Individualized Intervention Plan outlining the reasonable accommodations needed. Depending on their needs, the accommodations for tests and exams may include a quiet room, extra time, a computer with or without spell-check, enlarged print, an electronic reader and an electronic scribe. Students may also be permitted to use a laptop in class and receive class notes. Before each test or exam, a student registered with the service should complete the Accommodation form a minimum of five days before each test or exam. Students who need help filling out the form are welcome to consult the AccessAbility Centre staff. New students must submit an assessment that includes a clear diagnosis shortly after receiving their acceptance letter to attend the College. Each April and December all students receive an invitation to submit their documentation. They should email their assessment to the AccessAbility Centre. Students and their families are invited to meet with Adapted Services Counselor Dr. Ioana Constantinescu before they register for classes. Returning students should make an appointment with Dr. Constantinescu in Omnivox and bring in their assessment as soon as they recognize they need test accommodations. The College can provide referrals for psycho-educational testing and psychological services. the impact of the disability on academic performance. Marianopolis will consider the assessment’s recommendations for accommodations but cannot guarantee that it will grant any. The College reserves the right to refuse any documentation that does not conform to standard Canadian post-secondary practices and may request further documentation. All counselling is confidential and can be arranged by making an appointment through Student Services Technician Josie Cavaliere (A-154, ext. 244). Appointments must be booked at least 24 hours in advance and students must fill out the consent form before they come to their first appointment. Counsellors provide guidance and support with mental health, career and personal issues. They also offer support groups and workshops to educate the Marianopolis community, enable students to develop self-awareness, enrich interpersonal relationships and share concerns. See the Counselling Guide for helpful information and advice on their critical areas of support. An on-campus nurse is available 9:30 a.m. to 3:30 p.m. Tuesdays and Thursdays for confidential consultations on physical health concerns such as injuries, illness, contraception and stress management. Student volunteers of the First Aid Team are certified in First Aid and provide quick and efficient response to illness and injury. All students must complete the student medical form. Various forms of financial aid are available to Marianopolis students. Most students are informed of whether they will receive financial support in the spring, well before they must confirm if they will attend the College during the next fall semester. The Campus Store or”Wayne’s World” as it’s affectionately known, is the go-to place for students to buy just about anything and to get answers to just about every question they may have. Textbooks can be purchased at the Concordia University Store, a block east of the Guy metro station, at 1400 de Maisonneuve Blvd. W., Library Building, LB-03, (514) 848-3615. Course material can be found at concordiastores.ca/marianopolis. Online orders of $75 or more get free shipping; by selecting Click & Collect you can pick up your order in store for free. The Learning Resources Centre is the College’s tutoring hub. Typically, a tutor and tutee meet for one hour weekly for five to eight weeks to address difficulties with specific course content. The service is provided free of charge. Tutoring is offered in Biology, Chemistry, Economics, French, Mathematics (Arts/Science), Physics, Psychology, Quantitative Methods and Western Civilization. Most tutors are Marianopolis students, while some are recent graduates. Students who are are having difficulty in a course and are in good academic standing, that is, regularly participating in the class, may be eligible. Their teacher may be asked to confirm the student’s need for tutoring. Spaces are limited, but all efforts are made to accommodate as many students as possible, on a priority basis. Selected applicants will be contacted by Omnivox. Payroll Recording System for tutors. Login or register if you are first-time user. Every classroom is equipped with a teaching podium which includes Crestron presentation technology, a computer, a projector and screen. Students are welcome to bring their own laptop and easily plug and play their content to their class. The College has several computer labs used for teaching, where students can work when the spaces are not occupied by classes. The Mac Lab is equipped with software for art courses and video projects. The Music Tech Lab provides specialized music software and equipment for Music students. All computer labs have standard Microsoft Office software as well as specialty language software. Students are given an allotment of storage space which can be used to save their work and access it throughout the building and from home. The wireless network allows students to connect their own devices and print throughout the building. Students can access printers, photocopiers and express stations across campus. New students are given a small amount of print/copy credits at the beginning of their first semester. Students can add credits as needed via Omnivox or using the various cash boxes. Teaching and Learning Technology (TLT) is the ITS service counter in A-358, where students can drop by with technology questions, check out both MacBooks and Windows laptops, book and borrow cameras for class-related projects, and more. The display screens in various high-traffic areas across campus broadcast important information for students. The Writing Centre is not a proofreading service. English professionals examine a sample of student work to point out the types of language errors a student makes. They also provide theory and practice to improve a student’s language skills. They do not proofread assignments nor do they write or otherwise suggest content. While the Writing Centre provides support in all aspects of grammar, reading and writing, the Library provides help in research and citation styles. The College also offers a non-credit pre-college preparatory English activity, Preparation for English College Studies (PECS), for high school students who will begin college studies in English. Individual weekly sessions with the Writing Professional or an English monitor. Students who could benefit from guidance in English may request a series of appointments to reinforce their English language skills so that they can be more successful in their courses and the English Exit Exam. These sessions may include reading comprehension, grammar exercises, editing practices and error analysis. Office hours for occasional help in English or French. Writing Centre staff are available to see any student without any appointment during office hours, which are posted outside the Writing Centre. Individual regular sessions with a French monitor. Students in certain French classes are automatically assigned a French monitor; for example, students enrolled in French 602-100, 602-LPW and 602-009 benefit from individual sessions with French monitors to supplement class instruction. Topics include understanding spoken and written French, pronunciation, grammar and spelling. Individual weekly sessions with a French peer tutor. Students benefit from working together and, in peer tutoring, students help other students and learn from each other. Typically, both the tutor and the tutee establish goals at the beginning of the semester, with guidance from French teachers. Weekly sessions focus on areas most in need of French language support. Independent study. Tip sheets on English grammar, reading and writing topics are available at the Writing Centre. Students may complete the exercises included in tip sheets and review their answers with an English monitor during office hours. English Exit Exam preparation. Small group workshops provide additional focused support for comprehension, organization and expression evaluated in the Ministry of Education’s required English Exit Exam. Workshops are offered in the fall semester. Individual help is offered in the winter semester. Reviewing university application essays. Writing Centre staff, along with Academic Advisors, review and comment on university application essays. Writing Professional Dr. Suzanne Daningburg, A-265-B, ext. 279.